As America celebrates our second annual National Family Caregivers Month, Visiting Angels is proud to recognize and pay tribute to the many Americans who contribute to a family member’s care. To help ease what can sometimes feel like an overwhelming responsibility, we’ve put together the following short guide to avoiding caregiver stress and burnout. As a family caregiver, it’s hard to avoid stress and burnout if you’re unaware of the signs associated with caregiver stress. If you contribute significantly to a disabled or elderly family member’s care, you should be on the lookout for signs that you’re overwhelming yourself. Many family caregivers suffering from stress put off self-care until it’s too late. Often, family caregivers feel so pressed for time that they cannot imagine taking time for themselves. But in the long run, this mindset can have a damaging effect not only on you as a caregiver, but also on your relationships with friends, family, and the person you care for. Meditation. Meditation practices like yoga, mindfulness, and deep-breathing are excellent for relieving stress, and can be easily integrated into your daily life. Even a short, five-minute meditation break can be hugely beneficial to your personal well-being. Caregiver Support Groups. Many cities and towns have free, local support groups for family caregivers. Often, you can pick up helpful tips and suggestions on how to balance caregiving with your life. Other times, simply sharing your experiences with other caregivers can be therapeutic. Respite Care/Family Support. If you need help with caregiving, it’s okay to ask. Reach out to other family members and see if they’re able to provide you with support or take over parts of your responsibilities. Professional care for a few hours a week can also give you much needed time to relax, recuperate, and focus on your life. Speak with Your Doctor. No-one understands how to keep you healthy and well better than your doctor. If you find yourself overwhelmed by caregiver stress, speak with your doctor about ways you can reduce stress and improve wellness in your life. If you feel that outside help may be necessary to curb the stress you feel while caring for a loved one, support from a professional care provider may help. 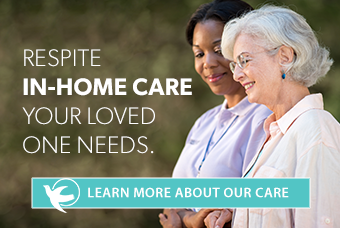 Call today to speak with your local Visiting Angels agency about respite care options. We’ve helped many family caregivers find peace of mind.